Last year, Samsung tried something a little kooky: it made a mash-up of a middling smartphone and a solid point-and-shoot camera (you know, the kind smartphones have nearly driven to extinction). 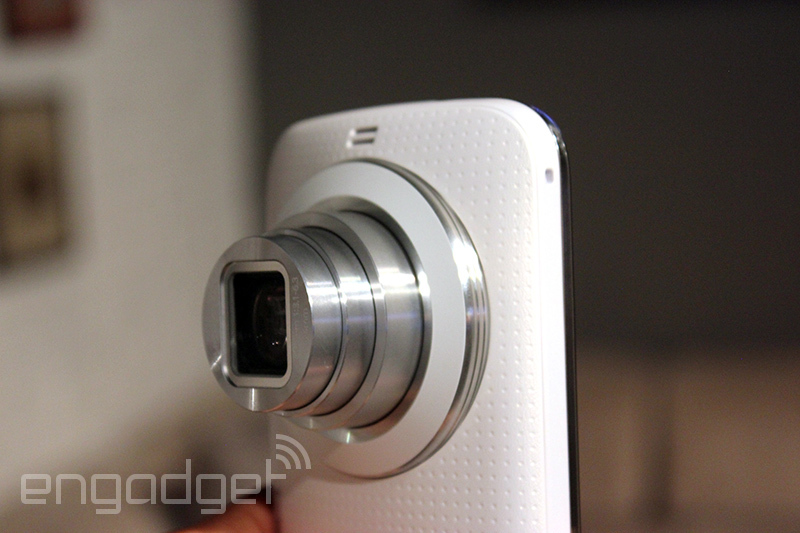 The resulting chimaera was called the Galaxy S4 Zoom, and it was… not great. To absolutely no one’s surprise, though, Samsung’s fixation on fusion is still going strong and the company’s trying to crack the code again with a new camera/phone combo called the Galaxy K zoom. Mildly silly name aside (the “K” stands for “kamera,” seriously), the international K zoom packs 2GB of RAM and one of Samsung’s hexa-core Exynos chipsets into its chubby, dimpled frame. In this case, the chip combines quad-core 1.3GHz and a dual-core 1.7GHz processors — the pairing isn’t as snappy as a Galaxy S5, but it’s still beefy enough to handle most people’s daily routines. Toss in 2GB of RAM, 3G and LTE radios, 8GB of internal storage and a spacious 4.8-inch 720p screen and you’ve got yourself a package that’s a bit more robust than most. If the name wasn’t a dead giveaway though, the K zoom’s 20.7-megapixel BSI CMOS camera sensor is the star of the show here. Samsung’s rear shooter is kitted out with optical image stabilization, the ability to shoot 1080p video at 60 frames per second and a slew of software features that aim to make your on-the-go photos less terrible. That all sounds fine enough on paper, but here’s the bigger question: what’s it like to actually use? The first thing you notice upon laying eyes on the K zoom is how much it looks like an actual phone, a design philosophy that stands in stark contrast to the mixed signals the S4 Zoom gave off. This time around, Samsung chose to make the K zoom sleeker and more comfortable to hold — we’d argue that’s a net positive, though we almost miss the curvaceous rump that acted as a grip on the K zoom’s ancestor. It’s not just the design that’s been improved. To no one’s surprise, it’s image quality is much better than its predecessor’s too — images the K zoom captured looked pretty sharp and reasonably vivid on its bright display, but we’ll refrain from passing judgment until Samsung gets around to shipping final hardware. That has a lot to do with the optics though, and at first glance that 10x zoom lens is a treat. You can pinch to zoom in and out just like you can on nearly any other smartphone, but there’s no cropping here — your gestures make the 10x optical zoom lens swoop in and out of the phone’s body. This, frankly, is beautiful. You don’t need to reset your expectations for how to interact with a smartphone camera, but the end result is significantly better shot than what you’d get out of a competitor without a moving lens. As always, Samsung went on a bit of a software spree to make it a hair easier to capture some quality shots. The Pro Select feature, for instance, automatically recommends five of the myriad available filters depending on what sort of environment and lighting conditions it sees. In the mood for a little tweaking? There’s also a full manual mode (naturally), but here’s the kicker: if you happen upon a combination of settings you really dig, you can make it a preset and upload it into an online store front where others can download it. And we of the selfie generation would be remiss if we didn’t mention the Selfie Alarm, which will automatically snap three shots of your own face using the main camera once your head wanders into the proper pre-defined position in space. 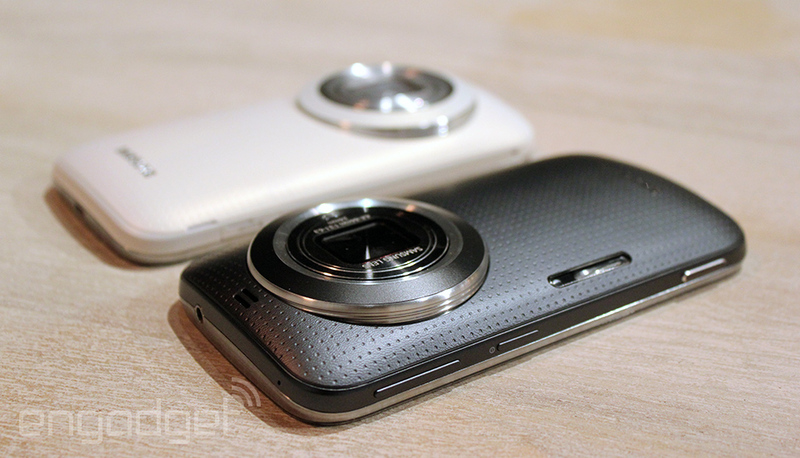 All things considered, we didn’t get to spend much time with the Galaxy K zoom at all. What does seem clear is that Samsung took a formula that was in dire need of polish and finally managed to do it some justice. At this point, the company hasn’t said exactly what the K zoom will cost or where specifically it’ll be available beyond Asia, but for now this thing isn’t slated to land in the United States.